Grab the binoculars because you're going on a bird watching adventure. Click here to play! Join Gus the bird watcher as he meanders through the jungle spotting the most exotic birds. If you can peep all of the birdies, you'll be handsomely rewarded. One particularly rewarding sight is that of the baby birds still in the nest. These birdie offspring act as an expanding wild. It only appears on selected reels but will cover the entire reel to help you create more wins. If you can spot a birdhouse, you'll be in real luck. These little red houses are jackpot symbols and two to five of them across a pay line will pay out up to 1500 times your bet. You'll want to keep your eye out for all the different types of birds as well, and there are quite a few! Spin parrots, toucans and blue, red and purple species to help you bring in the wins. Be sure to stick close to Gus the bird watcher because his symbol acts as a bonus. If you can spin three or more of him anywhere on the board, you'll trigger a bonus round that gives you even more chances to win. Get ready to go on a search for exotic birdies and plenty of cash! The baby birdie acts as an expanding wild. It only appears on reels 2, 3 and 4, but will expand vertically to cover the entire reel and help you create more winning combinations. 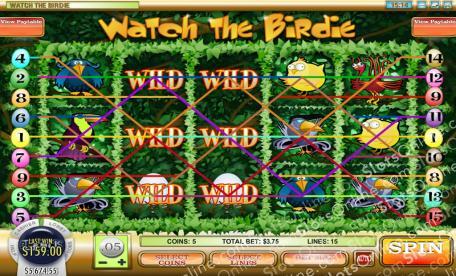 Gus the bird watcher will trigger the Find the Birdie bonus feature if you spin three or more anywhere on the board. During this game, you will have to try to find a certain bird (listed at the top of the screen) by choosing from a selection of eggs. Your feature ends when you choose four matches or run out of eggs.